The deadline to submit your nomination for the 2014 Notary of the Year is approaching. If you know a deserving Notary, be sure to nominate them for consideration by December 31. Five finalists will be chosen, and the 2014 Notary of the Year will be revealed at the NNA 2014 Conference, June 1-4 in Phoenix, Arizona. Candidates for Notary of the Year should follow the highest professional and ethical standards when performing notarizations, be active in volunteer efforts, and serve as a mentor and role model to colleagues. Any Notary can be nominated. 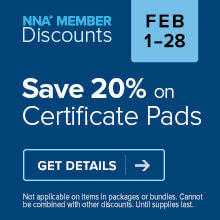 NNA membership is not required.